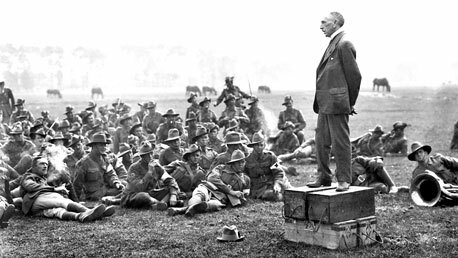 Billy Hughes was Australia’s prime minister for most of the First World War. He steered the nation through the horrors of the war and the peace settlement debates. Prime Minister from 1915 to 1923, he was a member of the House of Representatives from federation in 1901 until his death in 1952. During his 51 years as a federal politician, Hughes belonged to six different political parties. During his career in Federal Parliament Billy Hughes joined many political parties – Labor Party, National Labor Party, Nationalist Party, Australian Party, United Australia Party, and Liberal Party. He was expelled from three of them. The one party he never joined was the Country Party. He explained with his characteristic wit that he ‘had to draw the line somewhere’. Better known as Billy Hughes, he was ‘extraordinarily likeable’, although some of his opponents described him as a crab, a monkey, a rat and a spider. The iconic image of Hughes was as ‘the little digger’, lifted high on the shoulders of returned Anzacs. Billy Hughes’s views sometimes seemed to conflict. He was dedicated to the survival of the British Empire. But at the same time, he promoted and fought for Australian national interests. He was passionate about improving workers conditions. But in the end, he chose to leave the Labor Party in his determination to win the war at all costs. Two of the major issues Billy Hughes faced as prime minister during the First World War were the conscription referenda of 1916 and 1917, and the peace negotiations. Are you for or against conscription? Hear arguments from both sides of the debate and cast your vote. Can you influence people’s vote? Examine four political cartoons about Billy Hughes during the First World War.